This page offers an overview of Governor Generals, their term in office and the number of placards issued during a particular Governor General’s term in office. The table and the graphic bear evidence to the fact that most announcements were made during the bureaucratic second half of the eighteenth century. This is in line with the simultaneous expansion of the Resolutions of Batavia Castle. The low numbers for the seventeenth century should be viewed with suspicion. It is highly unlikely that the first three Governors General only issued nine placards throughout their total seven years in office. In fact, the number of placards issued during the early decades of colonial rule in Batavia had risen to such high proportions in the 1630s that GG Antonio van Diemen ordered on 23 April 1641 to make a compilation of all placards which had been issued in Batavia before. This first western law code in Indonesian history, the ‘Bataviasche Statuten’, was issued on 5 July 1642. 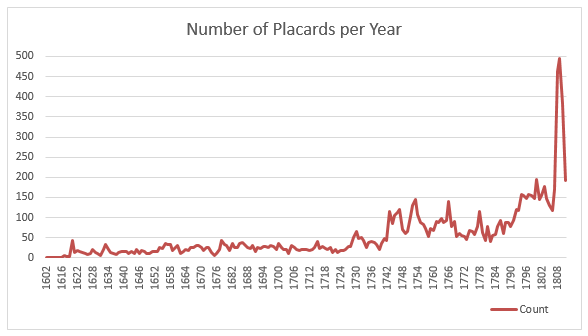 Further research in the Resolutions of Batavia Castle and the Resolutions of the College of Alderman in Batavia may reveal how many of the seventeenth-century placards were collected in compilations in the early eighteentch century. These compilations (inv. nrs. 224-2267) may be digitalized and published later.